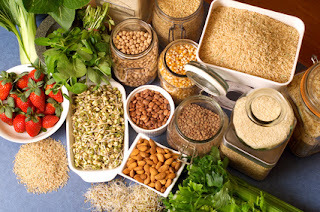 Dietary fiber is the part of food that is not affected by the digestive process in the body. Only a small amount of fiber is metabolized in the stomach and intestine, the rest is passed through the gastrointestinal tract and makes up a part of the stool. There are two types of dietary fiber, soluble and insoluble. Soluble fiber retains water and turns to gel during digestion. It also slows digestion and nutrient absorption from the stomach and intestine. Soluble fiber is found in foods such as oat bran, barley, nuts, seeds, beans, lentils, peas, and some fruits and vegetables. 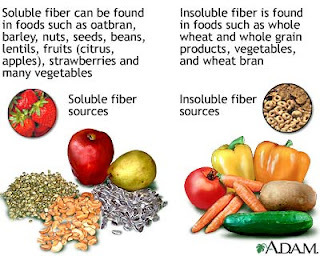 Insoluble fiber appears to speed the passage of foods through the stomach and intestines and adds bulk to the stool. It is found in foods such as wheat bran, vegetables and whole grains. I use Yerba Prima Psyllium daily. You can buy it at Whole Foods.